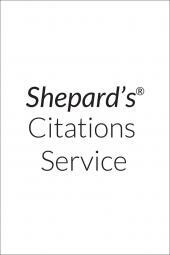 For over 100 years, Shepard's Citations have been a cornerstone of the legal research process. Expand your citations universe to include authority from other states with Shepard's Southern Reporter Citations. You can Shepardize any Southern Reporter citation to quickly determine where it has been cited and how it was treated. Determine if other state courts have cited a decision from your state, or if a court in your state has cited a neighboring court's decision. • Covers Alabama, Florida, Louisiana, and Mississippi.